Go to the website directly to experiment yourself. Here is how to proceed: To start, make sure the layers are turned on (button at the top left), then click on the federal state of your choice. In the pop-up window there are four visualization options: Energy Supply, Energy Demand, Energy Flows, and Energy Forecast. 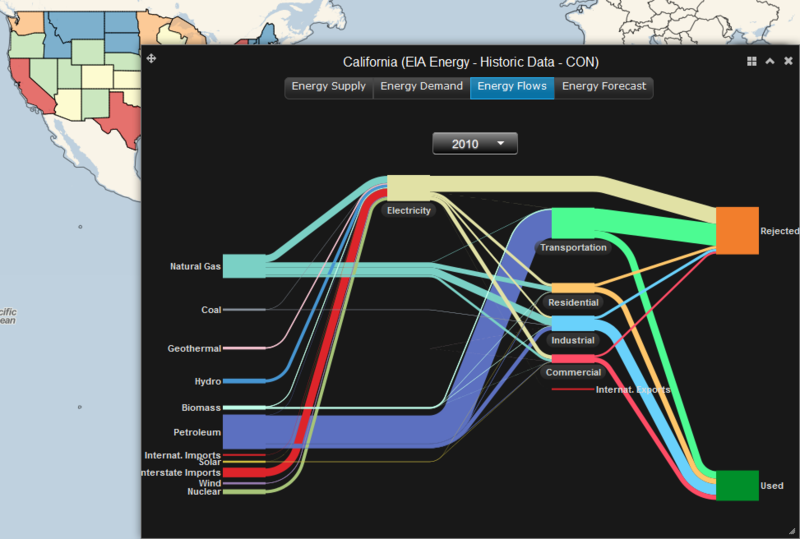 Choose ‘Energy Flows’ to produce the typical production/consumption Sankey diagrams. Hover over the bands to see more detail. FRED is really intuitive and fun to use. And it is open-access. You have more options when you register. According to the About section, among the future planned developments of FRED are “expanding FRED’s US coverage to global, adding energy expenditures and C02 emissions data, and allow[ing] users to extract FRED data and graphics”. Good!